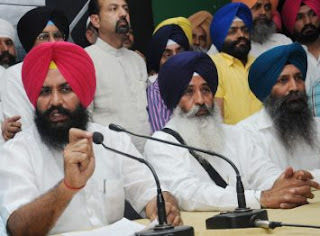 LUDHIANA, Punjab—Ludhiana based legislator Simarjit Singh Bains, who has recently joined the Aam Admi Party, has accused the Shiromani Akali Dal (Badal) led Punjab government of offering a perfect setting to allow the notorious gangsters to escape from Nabha jail. He has accused the Punjab government of being involved in orchestrating the attack. In a press note shared with @unitedsikhnews, MLA Bains said that the Punjab government is creating panic in the public, ahead of the 2017 assembly polls. He said that instead of taking appropriate action, the Punjab government issued high alert across the state and targeted members of the public with bullets. He said that the dismissal of Superintendent and Deputy Superintendent of Nabha Jail says a lot about the complexity of jailbreak. “…The jail personnel didn’t put up a fight, despite being alerted to the attack”. he added. He has appealed to Punjab masses to end hooliganism in Punjab by ousting the Badal led Shiromani Akali Dal from Punjab in the upcoming assembly polls of Punjab in 2017. It is pertinent to note here that the escaped gangster Vicky Gonder is a notorious professional killer with more than 30 murder cases registered against him by the Punjab police. He had come to public attention after the murder of gangster Sukha Kahlwan who was supposed to be a Congress supporter.